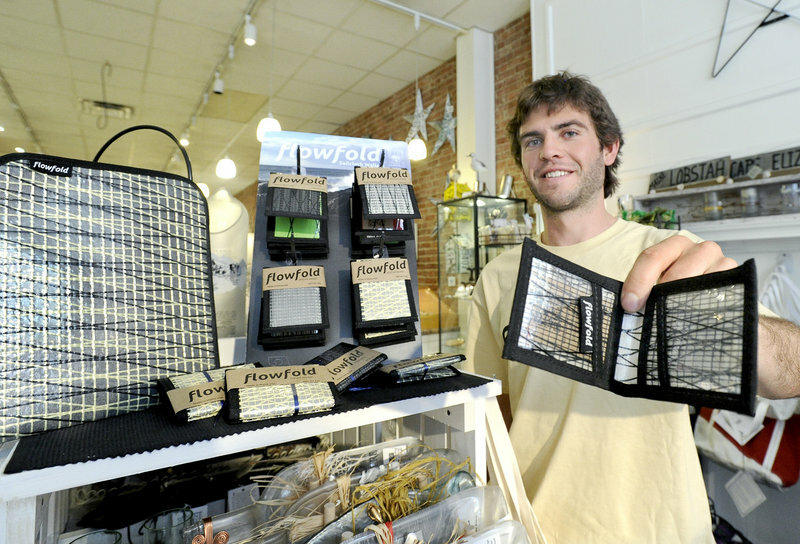 Flowfold, a company based on Peaks Island that makes wallets and tote bags from recycled high-tech sail material, was the victor in this year's business plan competition. Flowfold, a company based on Peaks Island that makes wallets and tote bags from recycled high-tech sail material, walked away Thursday night with $30,000 as the victor of the third annual LaunchPad business plan competition. Gorham Savings Bank created the LaunchPad competition in 2013 to help Maine businesses or promising startups that can demonstrate solid business plans and a compelling need for the money. This is Flowfold‘s second year reaching the final stage of the LaunchPad competition. It was a finalist in the 2014 competition, which was won by Bixby & Co., a Rockland-based chocolate company. Flowfold plans to use the $30,000 award to grow its business. “This Launchpad grant has provided the resources to purchase necessary equipment to scale production and delivery to national retail accounts, bringing a piece of Maine to homes across the country, and we are so excited and honored.” Devin McNeill, Flowfold’s co-owner, said in a statement. Five finalists took the stage Thursday night at the University of Southern Maine’s Hannaford Hall in Portland to pitch their businesses to a live audience and panel of three judges. • St. Germain Collins, a Westbrook-based environmental engineering firm that has developed its own web-based software tool to help clients manage their environmental compliance issues. The 2015 LaunchPad competition began with nearly 100 entrepreneurs across the state submitting their business ideas. Preliminary judging narrowed that group down to 10 semifinalists. Public online voting determined the five finalists. The three judges who selected Flowfold as the winner were Michelle Neujahr, director of Southern Maine Community College’s entrepreneurial center; Melissa Smith, president & CEO of WEX Inc.; and Chris Claudio, CEO of Winxnet. Don Gooding, executive director of the Maine Center for Entrepreneurial Development, emceed the event. McNeill and his partner Charles Friedman are alumni of MCED’s Top Gun accelerator program.